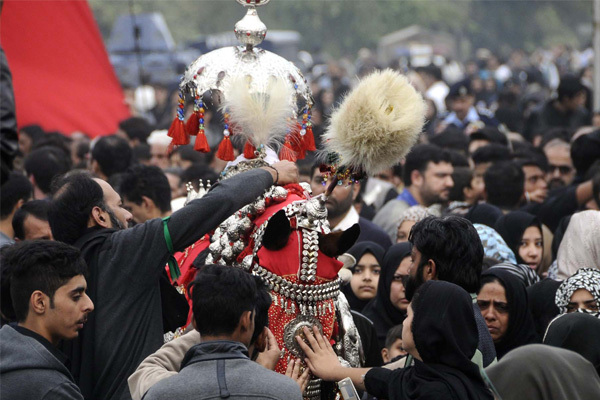 Chehlum of Hazrat Imam Hussain (RA) and other martyrs of Karbala is being observed Monday (today) with traditional religious spirit and reverence. Sensitive areas across the country are being guarded by police and the Army. Majaalis and mourning gatherings (chest beating) are being held in different city Imambargahs to commemorate the Karbala incident and highlight the message of Hazrat Imam Hussain (RA) and his companions. Alam and Tazia processions are being taken out from different Imambargahs and they marched through their respective and traditional routes peacefully. The main Zuljinnah procession was taken out from Haveli Alif Shah inside Delhi Gate in the morning and passed through its traditional route before concluding at Karbala Gamay Shah late in the night. The route of the main procession included Masjid Wazir Khan, Rang Mehal, Sunehri Masjid, Tehsil Bazar, Novelty Chowk, Bhatti Gate and Karbala Gamay Shah. Strict security measures were taken to safeguard the processions and no one was allowed entry in the procession without frisking and metal detector checking and walk-through gates. Hundreds of police personnel and special units were deployed on the route, on the roof tops of the buildings and other sensitive points and places. The main procession is scheduled to reach at culmination point Gamay Shah late in the night after the Urs proceedings of Hazrat Data Gunj Bukhsh. Majlis will be held at Karbala Gamay Shah after the culmination of the procession. The provincial government had announced a public holiday. Stringent security checks were put in place in Karachi as participants and mourners of Chehlum processions paid homage to Hazrat Imam Husain (AS) and other martyrs of Karbala. The main chehlum procession in Karachi will be taken out from Nishtar Park today and will conclude at Hussainiya Irania Imambargah Kharadar. The Sindh government has already imposed a two-day ban on pillion-riding of a motorbike in different cities as part of security measures. The ban came into effect at 12:00am last night and will remain enforced till Monday midnight. A notification has also been issued in this regard by the Sindh Home Department. Police and Rangers personnel had been deployed on the route of the main procession with an additional deployment of security staff equipped with snipers on the rooftops of buildings. Walkthrough gates and CCTV cameras had been installed to ensure foolproof security for the mourners. Moreover, 17,950 police personnel will perform the security duty. As many as 5,727 police officers and jawans would be deployed for the security of the main procession in the city at M.A Jinnah Road. The avenues of the processions were combed by personnel of the Bomb Disposal Squad with the help of sniffer dogs. Traffic on all leading thoroughfares thinned out as major markets and shops along the procession route remained shut. Some 100 big and small processions will be taken out while 460 Majalis will be held. Meanwhile, police took some 150 people into custody s in Karachi over violation of a ban on pillion riding. The ban was earlier imposed in the metropolis to ensure security during the religious event. The Interior Ministry has decided to suspend mobile phone services in Sindh and Gilgit-Baltistan today on Chehlum of Hazrat Imam Hussain (R.A). The measure was reportedly taken on the recommendations of security agencies while Pakistan Telecommunication Authority (PTA) was also taken into confidence in this regard. Cellular phone services will remain unavailable in Sindh from 12:00 noon to 10:00pm while in Gilgit-Baltistan it will be effective from 12:00 noon to 6:00pm. The mobile services will also remain suspended in four districts of Khyber Pakhtunkhwa that include Peshawar, Kohat, D.I Khan and Tank. Stupid moron shia community is playing with religion. All such activities must be banned by government. Shias have brougth shame to pakistan and islam. Their stupid religious custum have put interfaith harmony in trouble and they are cause of terror in pakistan. From your charming comments you have obviously been educated in a Wahabi Madarsa, fresh from being trained as a suicide bomber! Where is your Islamic education of tolerance towards other humans? Whilst you are living off the illegitimate income from Saudi Arabia and other Wahabi countries slaves of the Zionists, you need to educate yourself regarding teachings of Prophet PBUH. Brother, a question how many challam did Hazrat Muhammad (P.B.U.H) attended in his life or ask people to attend?